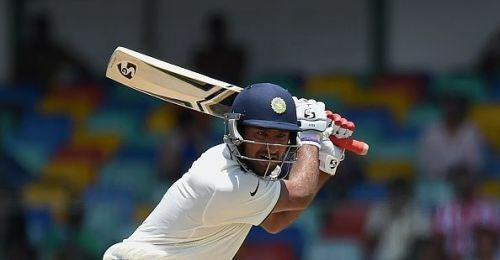 Indian Test cricketer Cheteshwar Pujara is confident that he can keep improving his game and eventually make himself a contender for selection in the shorter formats of the game as well. The Saurashtra cricketer has well and truly established himself as a vital cog in the Indian Test side but warned the opposition that his best is yet to come. "I am performing well, but I still feel there are areas I can improve and even perform better. So this is not the best phase of my life. I think the best is yet to come," Pujara said. Despite his impressive record in the longer formats of the game, Pujara has always been criticised for a lack of adaptability in the 50-over and 20-over formats, most notably by former Indian cricketer Virender Sehwag. Pujara is however confident that he can make necessary adjustments to his game to suit the demands of the limited-overs formats. "There will be a time when I will get my opportunity. At this point, all I can say is I am improving on a few things which is helping me in Tests and eventually will help me in the shorter formats," he said. Pujara has been one of the most consistent performers in the Indian Test side alongside skipper Virat Kohli, scoring 1,316 runs from 13 matches in the 2016-17 home season. He also scored two centuries in the recent Test series against Sri Lanka and was second top-scorer with 309 runs in 3 games, and will make himself busy with the County Championship, turning out for Nottinghamshire. With India set to play limited-overs cricket in the recent future, with the ongoing ODI series against followed by the home-series against Australia, Pujara admits that spending time in the County Championship has always helped him improve his game. Nottinghamshire is his third team in England, having played previously for Derbyshire and Yorkshire, and the 29-year-old feels that his technique has improved considerably by playing in the seaming conditions in England. India will take on Sri Lanka in the return series later this year before heading to South Africa for a challenging series and Pujara admits that it will be a daunting task for India having played the majority of their cricket in the past couple of years in conditions that they are familiar with. Pujara is however confident that the Indian side can rise to the occasion and stay true to their billing as the World's No 1 Test side. India have a busy season ahead with the Men in Blue taking on Australia at home in a five-match ODI series and 3-match T20 series following the ongoing series against Sri Lanka. They will once again face Sri Lanka, this time at home in November followed by the overseas tour of South Africa which is seen by many as what will be a true test of Virat Kohli's credentials as Indian skipper. Pujara has silenced his critics to establish himself as an automatic choice in the Indian Test side with his consistent performances and he only seems to be getting better with age. He has however made it clear time and again that he would like to play in the shorter formats of the game as well and only time will tell whether the Saurashtra batsman can add to his 5 ODI appearances for Team India and perhaps make an IPL return having last played in the T20 tournament in 2014.